There are so many ways you can support our organization and also impact the life of a soldier. We also would love to hear from you if you have ideas of how you could help us spread our mission or raise funds for our cause too so visit our contact page and send an email to give us your ideas! Monetary donations are always needed and appreciated for shipping costs which are hundreds of dollars each month as well as for additional supplies and food not donated. Your gift is Tax deductible and will be used to help our soldiers in need. Click HERE to Donate! Our primary purpose is to send our soldiers some “home away from home.” Visit our Requested Items page for a general list of the products we need and guidelines for what you should and shouldn’t purchase for the troops. We need baby clothes, blankets, burp cloths, diaper bags, pajamas, etc. from 0-12 months (boys and girls) to further support our young soldiers having children, both while they’re away and when they return home. 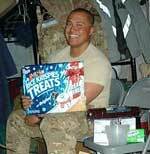 Send us your extra holiday candy and we will send it to some very happy troops on your behalf! They love chocolate and since we can only send it from October to February it’s a perfect way to help! Hit the store the day after the holiday and you can usually save 50% or more. Invite an S.O.S. representative to speak at your next civic, church, or VFW meetings to help us spread the word about S.O.S. and the needs of the soldiers. We are available to speak via Skype as well so anywhere in the country is possible! Click HERE to submit a request for a speaker. Many companies will match employee charitable donations, ask your employer if that program is offered and help us receive more donations for food and supplies! LIKE us on Facebook and become an active part of our social media campaign! 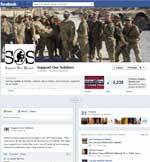 Leave messages of support for our soldiers on Facebook and SHARE our posts to let others know of our events and needs! Your school or church could have product or coin drives as well as Jean days, popcorn days, bake sales, car washes, any event to help raise funds for shipping costs and food. We have flyers available on this page for collection ideas! We have several items for purchase on our site to promote S.O.S. These include: shirts, caps, decals, cause bands, and more…please purchase these items and display them with pride. When someone asks about your S.O.S. gear, you can share information about our organization and how they can help! Click Here to get your S.O.S. Gear! Write cards throughout the year for our troops and for seasonal holidays like Valentines, Easter, July 4th,etc. We need two weeks before the actual holiday to include your cards in the care boxes. You can drop off or mail your cards to our headquarters. Click here for the address. We’re always looking for volunteers to help us organize events, promote S.O.S., write letters of support, and more. If you or your group would like to know about volunteer opportunities, send us a message through our contact page or call: 817-551-2908. Use the following links to download printable flyers and other materials you can use to promote and support S.O.S. "Support Our Soldiers was one of the most helpful services I had in Afghanistan. The packages I received were phenomenal. I always got to pick and choose anything I really wanted and if I ever needed anything I got it. I love and appreciate everything they did. Thank you so much SOS. I love what you do!!" "You reinforce our beliefs that people care that we are out here keeping America’s enemies as far away as possible from our loved ones." Troops. Some of them have reminded me of a kid at Christmas when your boxes arrive. Its nice to see the smiles that you have brought to their faces. Thank You again for the wonder things that you do."